The history of the Blackwood Radio Club. Between the years 1920 to 1930, numerous people in Australia were involved in experimentation with wireless or radio equipment. During this period about 20 different radio clubs were formed in South Australia. In December 1922, the Murray Bridge Radio Society was formed, with 15 members. The objects of the society were to 'aid members with advice and instruction in radio-telegraphy and telephony'. Above:- Article from the River Murray Advocate, Friday 12th January 1923. Courtesy of Trove. In 1923, the Blackwood Radio Club was formed by Owen Griffiths, Gordon Ragless VK5GR, and Robert Ragless. The club was based at the home of Owen Griffiths at Young Street, Blackwood. 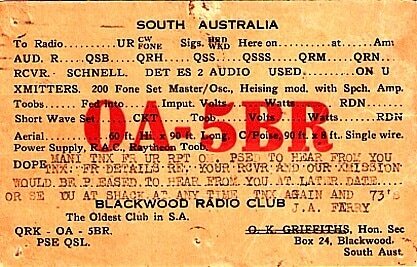 In 1924 the Blackwood Radio Club became affiliated with the Wireless Institute of Australia (WIA). The first Secretary of the club was Owen Griffiths, followed by Jack Ferry and Ford Wells. Presidents of the club included LH Griffiths, the father of Owen, and Bert Lampe. Members included Robert Ragless, Don Elliott VK5RD, Arthur Baust, Harry Wheeler VK5HW, Lionel Badenoch VK5LB, Keith Mutton VK5ZY, Jack Hume, Erne Hume, Percy Deer VK5DR, and Ivan Banyer. VK5BR operated on wavelengths between 170 and 200 metres until October 1932, using the station for communication with other experimental stations, and for experimental broadcasts. Transmissions were restricted to times when broadcast stations were off the air, essentially Sunday mornings and after 10pm in the evening. Transmissions first commenced from Young Street, with a transmitter which used a split series Hartley oscilliator with Telefunkern system of modulation. Inout power was only 3 watts, however reports were received from as far afield as Moonta and Kadina. Transmissions included recorded music played from a phonograph acoustically coupled into a microphone. The Club also had its own studio orchestra made up of its own members. The transmitter was soon upgraded to a Colpitts master oscillator using a UX201A valve driving a UX210 valve as an amplifier. This was Heising modulated with a Philips A630 valve (later changed to a B605 valve). Input power to the amplifier was 8W. 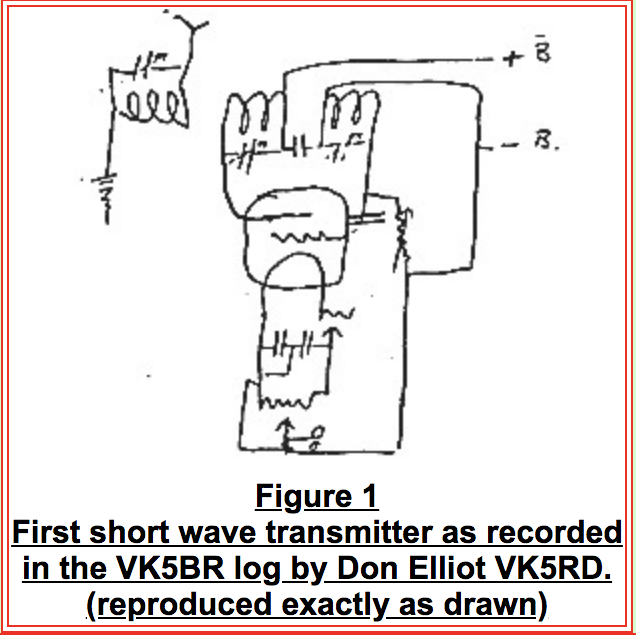 In 1928 a shortwave transmitter was constructed by Don Elliott VK5RD. This used a split series Hartley circuit with 250V on a UX210 valve running 40mA to provide 10W of input power. Don made a rough sketch of the circuit in the VK5BR log (it can be seen below). The shortwave receiver was constructed from the popular Schnell circuit consisting of a regenerative detector and two stages of audio. The circuit diagram for this was found in a section of the Blackwood Radio Club correspondence and the diagram is reproduced in figure 2.The antenna used with the original shortwave equipment was Zepp fed. ​In January 1928 the first shortwave contacts were made by Don Elliott. This was on the 32 metre band and using the CW mode. Communication was set up for every Friday evening between 7pm and 11pm. Contacts were made with interstate and overseas stations. Between October 1932 and January 1934 there appears to have been a break in the operations of VK5BR. Transmissions recommenced in January 1934 on the 80m band using the precise frequency of 3.593kHz. This continued until April 1935. At some stage, the club must have further upgraded its transmitter to around 30W input. The log records figures of 600V at 50mA as early as April 1930. The precise frequency of 3.593kHz also indicates that they had probably changed to crystal control. Advertiser and Register, Adelaide, Saturday 16th May 1931. The club station shifted its location a number of times. It was first located at Young St, Blackwood, and then at Waite St, Blackwood, both the Griffiths residences. Around 1930, it was relocated to the home of Jack Ferry in Clapham and, around 1934, to the home of the Hume family at Parkside. This was also the original location of Broadcast Station 5DN, established by the Hume family. ​After 1935, the equipment was not operated, and some of it was stored at the home of Gordon Ragless. 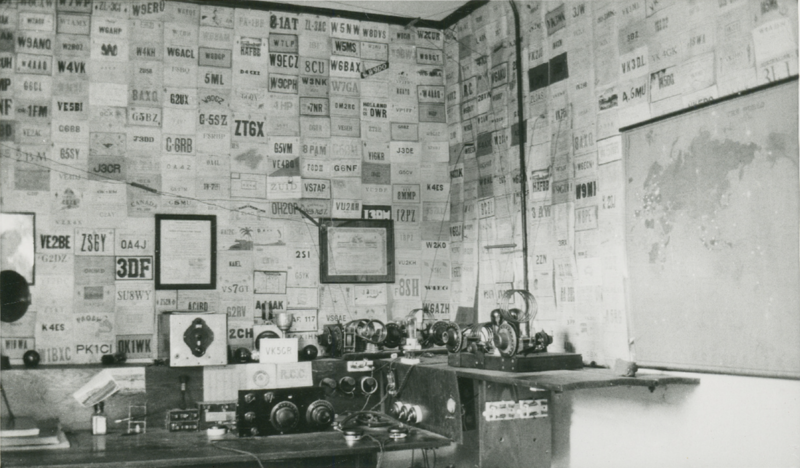 Above:- Radio Room at "Wattiparinga" Section 62 Hundred of Adelaide, set up and operated by Gordon Beaumont Ragless. Call cards decorate the wall, the marked map show where contacts had been made. Image courtesy of Trove. During the period 1926-1929, frequent operators of the club station were Owen Griffiths, Gordon Ragless, Ford Wells, Robert Ragless and Don Elliott. Frequent announcers when the station broadcast were Owen Griffiths, Jack Ferry, Harry Wheeler, Oswald Ragless, Frank Hill, Robert Ragless, Ford Wells, Douglas Wright, John Messer, Milton. Trott, Sid Maag, S Macey and H Naughton. During the early years, contacts were made with many other stations, but not all of these were licensed. Many came under the category of`what was known as an IWW, which stood for "IIlicit Wireless Worker" or, in the words of Gordon Ragless, 'I Wonder Who". They are more commonly known today as pirates. ​In the period 1930-1932, station operators were Jack Ferry, Ford Wells, Lionel Badenoch, Frank Hill, Jim Drummond, Ron Wauchope, Erne Hume and Milton Trott. From 1934 at the Parkside location, operators were Ford Wells, Frank Hill, Erne Hume, Jack Hume and Jim Drummond. The image on the left below, shows a QSL card from VK5BR for a contact in this period on 80m. This demonstrates that, at that time, the RF power amplifier was push/pull 46 tubes with 500V on their plates running an input power of 10W. Grid modulation was used and the antenna is some form of Marconi. The image on the right shows a card initiated from the earlier period when the callsign prefix was 'OA'. It is interesting to observe how so many amateur radio experimenters turned to radio as a career and often the reverse. Some of the operators of the club station sought a career in radio broadcasting. Erne Hume was chief engineer at station 5DN from 1925 to 1941. He designed much of the transmitting and studio equipment used at that station, and designed the original transmitter at 5RM Renmark. 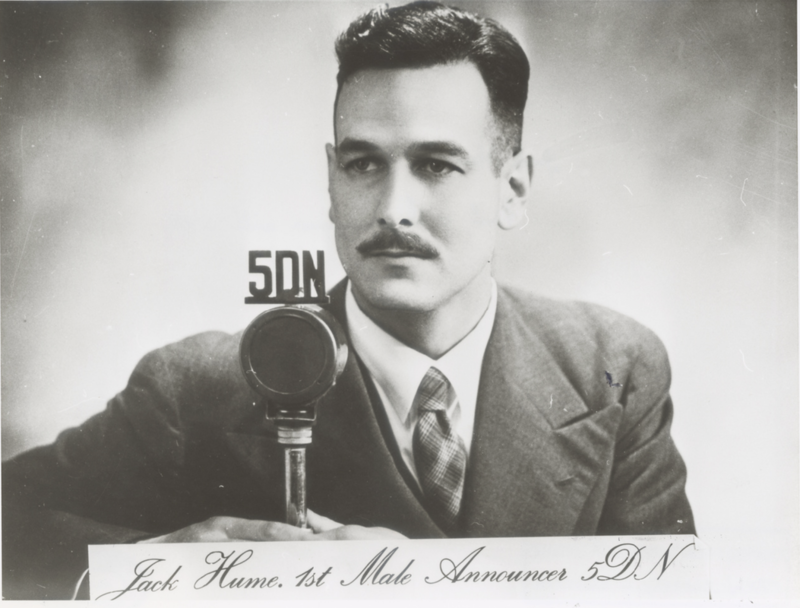 Jack Hume was an announcer at 5DN for some years and was involved in other broadcasting activities such as writing plays. Frank Hill and Ford Wells became members of the technical staff at 5DN and 5RM. Between c. 1931 to 1935, the club published an official publication called "KEY-KLIX", which was edited by Ford Wells. A typical issue for February 1932 included an editorial, a technical article on television by Harry Wheeler VK5HW, shortwave notes by Gordon Ragless VK5GR and other features. The Blackwood Radio Club arranged for interesting technical lectures at its meetings and arranged for visits to such places as Radio Station 5DN, the Unley Telephone Exchange, the Adelaide Observatory and the Hackney Tram Depot. It also organised social events such as the Blackwood Radio Club picnic and other field days. One of the field days included a visit to Kangaroo Island via the old SS 'Karatta' to visit a radio amateur on the island. Another activity was the provision of radio for the Adelaide rowing event, Henley on Torrens. 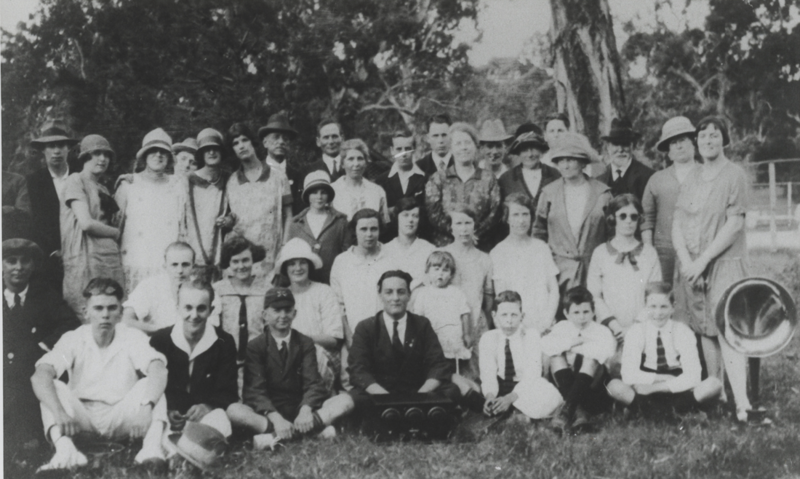 Above:- Blackwood Radio Club picnic, c. 1926. Image courtesy of Trove. For many years, the Blackwood Radio Club ran a monthly dance which was held at the Eden Hills Parish Hall. It also held an annual radio concert at the Boys Club Hall in Blackwood. 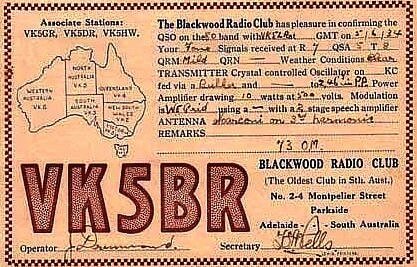 From all accounts, the Blackwood Radio Club became quite a social organisation, with social and not just technical type of membership. Above:- Article from The News, Monday October 22nd 1928. The club ceased to be active around 1937, a little before the start of World War 2. 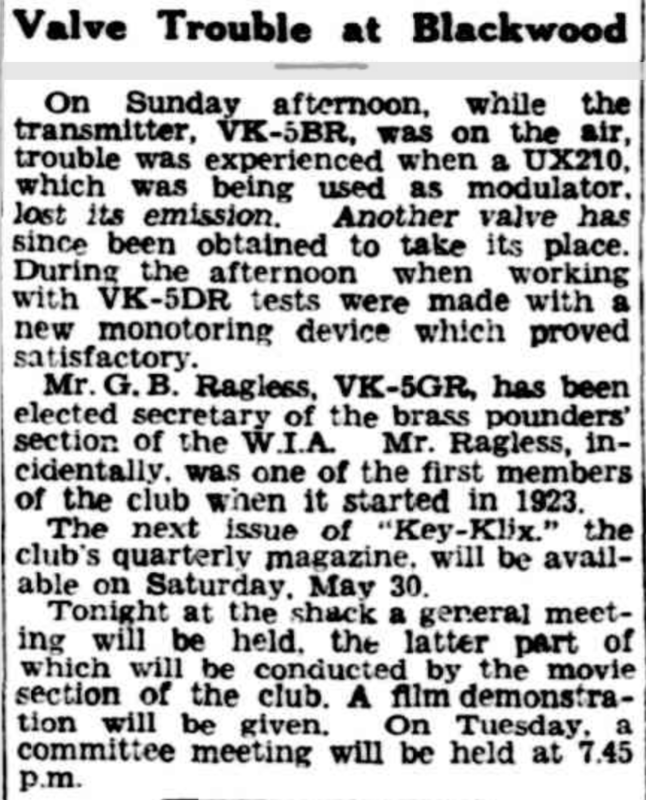 The club was not reactivated after the war and its callsign VK5BR was allowed to lapse. The callsign was reallocated to Lloyd Butler in January 1946 and still remains in his hands.